Home Arrive Istanbul A Sofya Chora Cistern Dog Camp Top! quality travel opportunities to remarkable destinations. it is a charged cultural and physical pilgrimage that will generate lifelong memories. 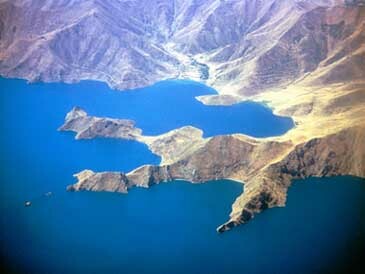 Earth View Adventures is the only US company offering this exotic journey. 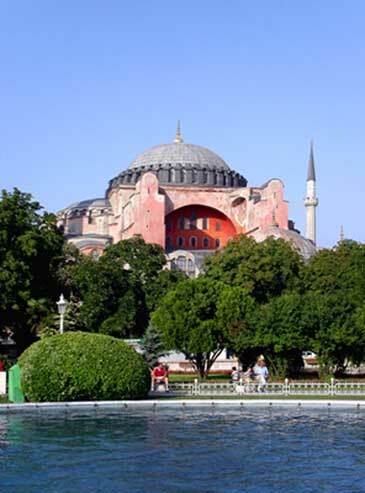 Our two-week adventure starts in Istanbul, with its swirling mix of cultures straddling Europe and Asia. 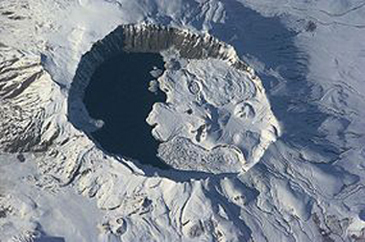 After sampling some of Istanbul’s sights, you fly east across Turkey to Van on the shores of Turkey’s largest lake, Lake Van where you visit a 10th century Armenian church on Akdamar Island, then climb 10,006-foot Nemrut Dagi and camp by the mountain’s 5 unique crater lakes. After trekking between two lakes, you climb 13,315-foot Mount Suphan, Turkey’s third highest peak. Then it’s on to Dogubayazit, where you spend 4 days climbing to the famous, ice-clad summit of 16,854-foot Mount Ararat, Turkey’s highest peak. The ancient volcano dominates all within sight of it, and from the summit, you can see 4 countries. After descending from the mountain, you visit Noah’s Ark National Park and Ishak Pasha Palace before returning for another look into Istanbul’s myriad sights and shopping. you do not have to do the climb. We can arrange for some members of your group to do the climb while others enjoy the sights near the mountain. Gerry moved to Boulder Colorado as a lad in 1954, and started climbing rocks and mountains shortly thereafter. Over five decades later, he continues pursuing his travel and mountaineering passion with all the energy he can muster. In the intervening years, Gerry became a world-class mountaineer. After climbing Mount Everest in 1983, he went on to become the second person to climb the highest peak on each of the seven continents in 1985. In over 50 years of mountaineering that span 6 different calendar decades, Gerry has been on more than 30 major expeditions and traveled in dozens of countries. In 2003, Gerry became the first person to climb every major peak over 16,000 feet in North America and he received the Sierra Club’s coveted Farquhar lifetime achievement award for mountaineering in 2005. Stan is the first person to bicycle across 6 continents. In 2006, Stan completed a 14-year quest to cycle nearly 20,000 miles coast-to-coast across all of earth’s six bike-able continents. Stan’s other passion is climbing; he is a ski instructor, triathlete and mountaineer. He has climbed in the Himalayas, Karakorum, on Denali in Alaska, the Matterhorn in Switzerland, Kilimanjaro in Africa, Mount Elbrus in Russia, Aconcagua in Argentina, and all the 14,000-foot peaks in Colorado. Stan’s lifetime of extraordinary adventures and unique cultural experiences give him a superlative world view that he is eager to share. 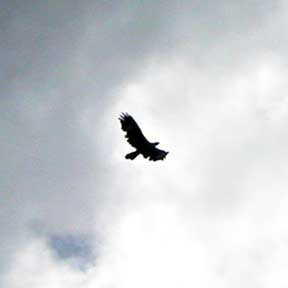 On an Earth View Adventures trip, you will always have a knowledgeable, American, English speaking companion with you. We do not simply sign you up with a foreign tour operator. After your transfer from the airport, enjoy a welcome drink in the open air from the rooftop of one of Istanbul’s fine hotels. 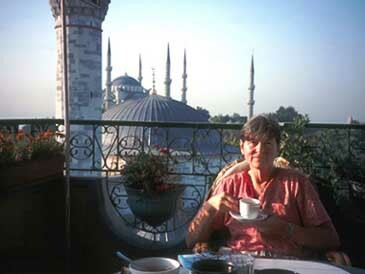 There are stunning views of both the Blue Mosque and the ancient Aya Sofya. At dusk, listen to Islam’s traditional call to prayer. Bordered by 8 different countries and 5 seas, Turkey sits in a swirl of cultures aged like fine wine. The modern, prosperous country bridges east and west as well as north and south. All ancient roads passed through this region, and Christianity and Islam meet here. 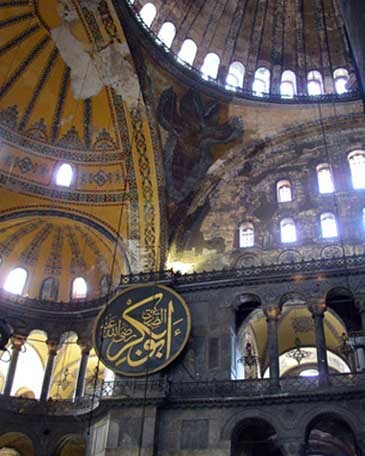 You spend the day touring a combination of the following sights: Aya Sofya (in photo), Chora Church, Blue Mosque, Hippodrome, Grand Bazaar, Basilica Cistern, and the Suleymaniye Camile Mosque. Click the photo for information about these famous sites. Transfer to the Istanbul airport for an early, 2 1/2 hour non-stop flight east across Turkey to the town of Van on the shores of Turkey’s largest lake - Lake Van. 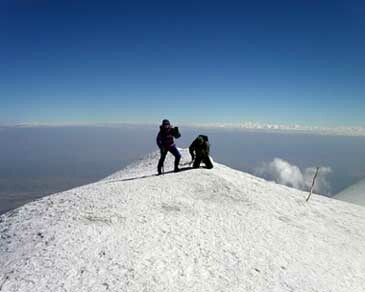 In the afternoon you rejoin the vehicles and camp below Mount Suphan at 9,025 feet. 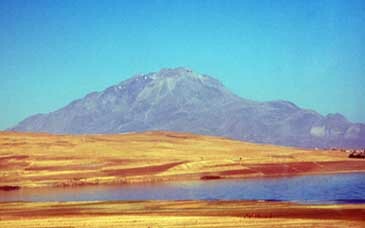 Suphan Dagi is Turkey’s third highest peak. 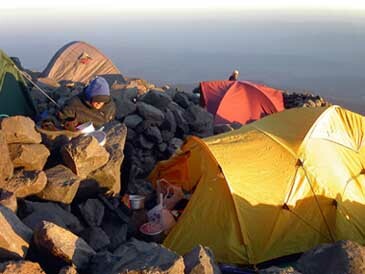 After this exciting all day hike, you will spend a second night below the peak. After a leisurely breakfast, you drive to the town of Dogubayazit at 5,100 feet where you check into the Hotel for a welcome shower and rest. You can see Mount Ararat from the hotel’s top floor. Today, begin your ascent of Ararat. Drive one hour from Dogubayazit to the small, summer village of Eli at 6,500 feet (1,981 m) to meet our muleteers. After the animals are loaded, you hike up 4,200 feet (1,280 m) to Camp 1 at 10,700 feet (3,261 m), which is called the “Green Camp.” While the elevation gain is substantial, the hike is on gentle grades, and there is a trail all the way. This hike typically takes 4 to 5 hours. Depending on the season, there is a small creek gurgling through the Green Camp, and this is a delightful place. The mountain now looms overhead and you can preview the rest of the route. You can use this day to gather yourself and prepare for the summit climb. 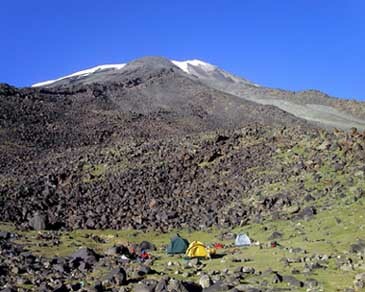 You can hike above Green Camp for acclimatization, or perhaps, just rest in Green Camp, then spend a second night in Green Camp at 10,700 feet. Today’s hike takes you from the Green Camp at 10,700 feet (3,241 m) to High Camp at 13,400 feet (4,084 m). The elevation gain of 2,700 feet (823 m) is less than the hike up to Green Camp and the distance is shorter, but the terrain is steeper, and of course, the elevation is higher. The trail to high camp is up loose pumice through the lava, and the average hiking time from Green Camp to High Camp is 2 to 3 hours. Mules carry your supplies to High Camp, then return to Green Camp for the night. You spend the afternoon acclimating and preparing for your early start on the summit climb. 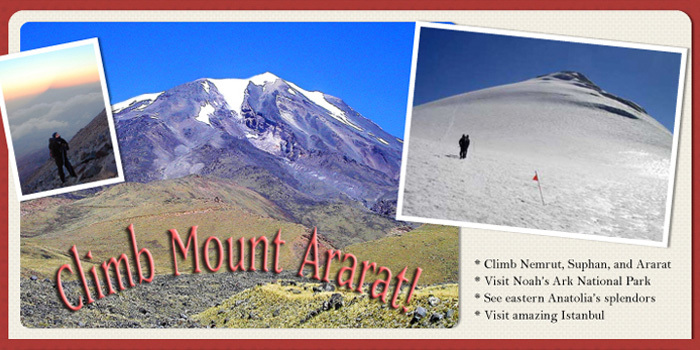 Day 10: Climb to Ararat’s Summit! The great day finally arrives! Up at 3AM and hiking by 4AM, you hike the first hour and a half by headlamp. Switching off your lights, you can enjoy the sight of the peak’s triangular shadow streaking toward the western horizon. The point at which the hiking ends and one must switch to crampons varies depending on the season. 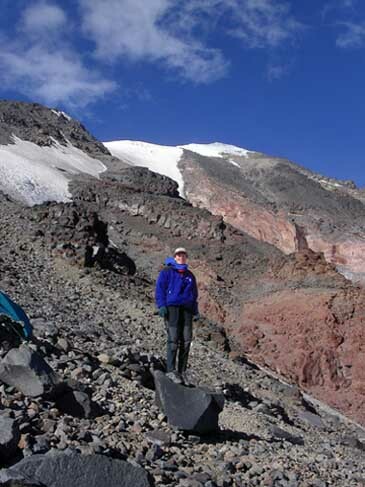 In August, you can hike to nearly 16,000 feet (4,877 m) before stepping onto the snow. The snow can be hard and crampons are needed. Crunching up on the sacred summit ice is a summit ride to remember, and from Anatolia’s highest point your mood is free to match the wide open, 360 degree horizon. The elevation gain on summit day is 3,453 feet (1,052 m), and the typical climbing time from High Camp to the 16,853-foot (5,137 m) summit is 5 to 6 hours. On the summit day we will descend to Green Camp. If you were successful on Day 10, we will descend to the trailhead and return to Dogubayazit on Day 11. If the summit weather was bad or you were unsuccessful on Day 10, you can remain at high camp and make a second summit attempt on Day 11 then descend all the way to Dogubayazit. 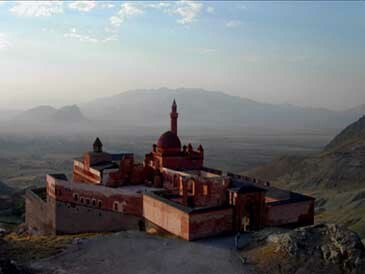 Today, you tour several fascinating sites near Mount Ararat and Dogubayazit. First, you visit Meteora, which is a strange meteor crater. 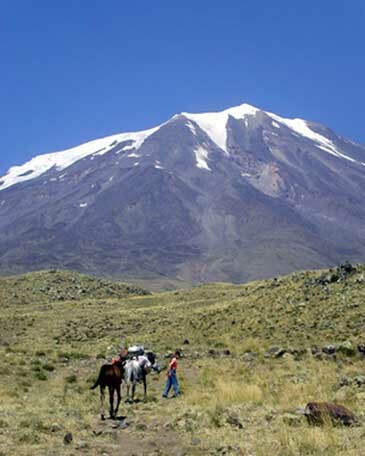 This open area also offers a nice view of both Mount Ararat and its companion peak, Little Ararat. Next, visit the intriguing Noah’s Ark National Park, which contains an ark-shaped rock formation that many believe is the remains of Noah’s Ark. 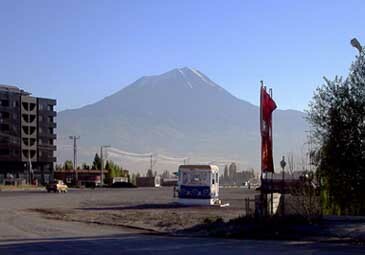 Return to Dogubayazit for lunch at a rooftop restaurant with a view of Mount Ararat. In the afternoon, when the light is favorable for photography, visit the famous Ishak Pasha Palace (in photo), then return to the Hotel for the night. With an early start from the hotel, you drive to Van to connect with a mid morning flight back to Istanbul. 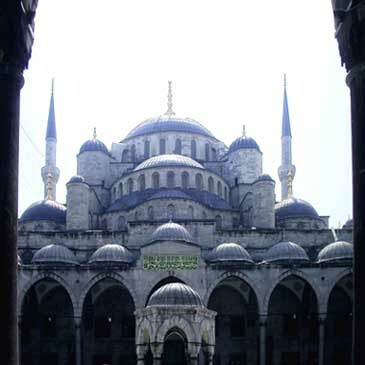 You are back at your hotel in Istanbul by early afternoon, which leaves several hours for shopping and sightseeing. There are many sights within walking distance of the hotel, including the Grand Bazaar. It is impossible to absorb all of Istanbul’s cultural offerings in one day, so we spend this day shopping and visiting sites that we missed on the first day. You can add the Bhosphorous Bridge, the Beylerbeyi Sarayi Summer Palace and the Basilica Cistern to your feast. Transfer from your hotel to the Istanbul airport for your flight home. I am a part of all that I have seen. Copyright © 2009-2018 by Gerry Roach and Stan Havlick. All Rights Reserved.